It's astonishing just to list the many roles of Jane Addams: social worker, social reformer, and co-founder of Hull House; teacher and member of Chicago's Board of Education; international peace activist; women's rights and suffrage activist; philosopher; and lecturer and writer. In 1931, the Nobel Peace Prize was jointly awarded to Jane Addams and Nicholas Murray Butler. Addams was recognized for her role as president of the Women's International League for Peace and Freedom, an organization she founded in 1919. The Nobel committee also noted her role in helping the poor and, in particular, her efforts in relationship to child labor and for her aid to immigrants at Hull House. One of Jane Addams's long-time partners was Ellen Gates Starr, whom she met when they both attended the Rockford Female Seminar in Rockford, Illinois. Although Jane Addams is better known as the founder of Hull House, the settlement house project was co-founded with Starr, both of them inspired by their trip to Europe and, in particular, their contact with the English settlement-house movement. 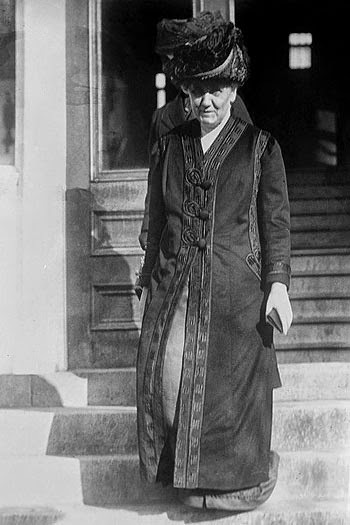 Jane Addams died on 21 May 1935, a year after Smith's death. Some of the best information about Addams is available through the Nobel website, including a biographical essay, complete bibliography, a photo gallery, and links to useful online resources (click here).